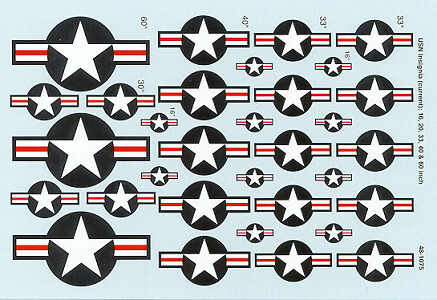 A modeler always needs insignia and this is more so in today's decal market where one often does not get a full set of insignia due to a lack of space on the sheet or the desire to do another of the options on the sheet. This set offers full color insignia for a variety of USN aircraft from the 1960s and 1970s. This includes the A-4, A-7, F-4, F-8, F-14 and S-3. The various sizes are noted on the sheet and the accompanying guide indicates which sizes are appropriate for which aircraft. A very useful sheet and one that should be in the stash of every USN modeler. Review copy courtesy of . Thanks for your support.